Production: Nero-Film A. G. Verlag Star Film-G.m.b.H. ; black and white, 35mm; running time: originally 117 minutes, according to Eisner an 89 minute version is most commonly shown now, though some sources list current version as 99 minutes. Released 11 May 1931, Berlin. Re-released 1933 in the U.S. in a dubbed version. Filmed during 6 weeks of 1931 in Nero-Film A. G. Verlag Star Film-G.m.b.H. studios in Berlin. Producer: Seymour Nebenzal; scenario: Thea von Harbou and Fritz Lang, from an article by Egon Jacobson, based on the Düsseldorf child murder case; photography: Fritz Arno Wagner and Gustav Rathje; editor: Paul Falkenberg; sound: Adolf Jansen; production designers: Emil Hasler and Karl Vollbrecht; music ( Murderer's Theme ): Edward Grieg, based on an extract from Peer Gynt ; backdrop photographs: Horst von Harbou. Cast: Peter Lorre ( Hans Beckert, the murderer ); Gustaf Gründgens ( Schränker ); Ellen Widmann ( Mrs. Beckman ); Inge Landgut ( Elsie Beckman ); Otto Wernicke ( Inspector Lohmann ); Franz Stein ( Minister ); Theodor Loos ( Inspector Groebor ); Fritz Gnass ( Burglar ); Fritz Odemar ( Safecracker ); Paul Kemp ( Pickpocket ); Theo Lingen ( Con-Man ); Georg John ( Blind beggar ); Karl Platen ( Night Watchman ); Gerhard Bienart ( Inspector's secretary ); Rosa Valetti ( Landlady of the Crocadile Club ); Hertha von Walther ( Prostitute ); Ernst Stahl-Nachbaur ( Chief of Police ); Rudolf Blümner ( Lawyer ). von Harbou, Thea, and Fritz Lang, M , edited by Gero Gandert and Ulrich Gregor, Hamburg, 1963; translated as M , London and New York, 1968. M le maudit , Paris, 1990. M , in Iskusstvo Kino (Moscow), no. 11, November 1994. Huaco, George, The Sociology of Film Art , New York, 1966. Ropars-Wuilleumier, Marie-Claire, Le Texte divisé: Essai sur l'ecriture filmique , Paris, 1981. Eisner, Lotte H., Fritz Lang , Cambridge, 1988. Humphries, Reynold, Fritz Lang: Gender & Representation in His American Films , Ann Arbor, 1989. Levin, David, Richard Wagner, Fritz Lang & the Nibelungen: The Dramaturgy of Disavowal , Princeton, 1998. McGilligan, Patrick, Fritz Lang: The Nature of the Beast , New York, 1998. Gunning, Tom, The Films of Fritz Lang: Modernity, Crime & Desire , London, 2000. Lang, Fritz, "Mein Film M: Ein Tatsachenbericht," in Filmwoche (Berlin), May 1931. Hirsch, Leo, in Berliner Tageblatt , 12 May 1931. Arnheim, Rudolf, in Weltbühne (Berlin), 19 May 1931. Variety (New York), June 1931. Hall, Mordaunt, in New York Times , 3 April 1933. Troy, William, in Nation (New York), 19 April 1933. Barry, Iris, in Museum of Modern Art Bulletin (New York), June 1933. Eisner, Lotte, "Notes sur le style de Fritz Lang," in Revue du Cinéma (Paris), 1 February 1947. Gesek, Ludwig, "Fritz Lang: Suggestion und Stimmung," in Gestalter der Filmkunst: Von Asta Nielsen bis Walt Disney , Vienna, 1948. Autera, Leonardo, "Il parabola di Fritz Lang," in Cinema (Rome), 15 January 1954. Mourley, Michel, "Trajectoire de Fritz Lang," in Cahiers du Cinéma (Paris), September 1959. Ramseger, Georg, "30 Jahre alt und alterlos: In der Urania ist Fritz Langs M jetzt wieder greifbar," in Welt (Hamburg), 16 January 1960. Sarris, Andrew, in Village Voice (New York), 1 September 1960. Bellour, Raymond, in Cinéma (Paris), no. 58, 1961. Kuhlbrodt, Dietrich, " M : Wieder in Deutschland," in Filmkritik (Munich), no. 3, 1961. Domarchi, Jean, "Avec M le Maudit : Fritz Lang en 1932 annonçait la destinée de l'Allemagne," in Arts (Paris), 26 April 1961. Gilson, René, in Cinéma (Paris), August-September 1961. "Kein Mörderspiel: Fritz Lang's M von 1931," in Frankfurter Allgemeine Zeitung , 11 December 1961. Lefevre, Raymond, in Image et Son (Paris), June 1962. Porter, Miguel, "La estructura profetica en M ," in M: El vampiro de Dusseldorf , Barcelona, 1964. Sandras, Michel, " M le Maudit et l'expressionisme," in Image et Son (Paris), January 1964. Eisner, Lotte, "Le Style de M le Maudit ," in Avant-Scène du Cinéma (Paris), 15 July 1964. Jensen, Peter, in Classics of the Film , edited by Arthur Lennig, Madison, Wisconsin, 1965. Jahnke, Eckart, in Film (East Berlin), no. 6, 1965. Rhode, Eric, "Fritz Lang (The German Period 1919–1933)," in Tower of Babel: Speculations on the Cinema , New York, 1966. Wiegand, Wilfried, "Der Regisseur von M ," in Frankfurter Allgemeine Zeitung , 5 December 1970. Kinder, Marsha, and Beverle Houston, in Close-Up: A Critical Perspective on Film , New York, 1972. Burch, Noël, "De Mabuse à M : Le Travail de Fritz Lang," in Revue d'Esthétique (Paris), 1973. Kuntzel, Thierry, "The Treatment of Ideology in the Textual Analysis of Film," in Screen (London), Autumn 1973 (and reply by Nicolas Garnham in same issue). Dadon, R., "Le Pouvoir et sa folle," in Positif (Paris), December 1976. Del Ministro, M., "Una ipotesi psicoanalitica per la lettura," in Cinema Nuovo (Bari), November-December 1977. Carroll, Noël, "Lang, Pabst, and Sound," in Ciné-Tracts (Montreal), Fall 1978. Chang, J. S. M. J., " M : A Reconsideration," in Literature/Film Quarterly (Salisbury, Maryland), no. 4, 1979. Audibert, L., "Dossier: Du muet au parlant: L'Ombre du son," in Cinématographe (Paris), June 1979. Barros, L. de, "Uma obraprima de Fritz Lang," in Celuloide (Rio Major, Portugal), August 1979. Petat, J., "L'Ouverture de M le Maudit ," in Cinema (Paris), June 1982. Frascani, F., "Hitler era geloso del Morder di Fritz Lang," in Cinema Nuovo (Rome), May-June 1989. Garncarz, J., "Fritz Lang's M : A Case of Significant Film Variation," in Film History (London), vol. 4, no. 3, 1990. Koseluk, C., "Comic Book Antihero," in American Film , vol. 16, no. 2, February 1991. Rolfe, Hilda, "The Perfectionist," in Film Comment (New York), vol. 28, no. 6, November-December 1992. Kaes, A., "The Cold Gaze: Notes on Mobilization and Modernity," in New German Critique , no. 59, Spring/Summer 1993. Lattuada, A., "Un film, un realisateur, deux comediennes," in Positif (Paris), no. 400, June 1994. Hoberman, J., "Stormy Weather," in Village Voice (New York), vol. 42, 17 June 1997. Dimendberg, Edward, "From Berlin to Bunker Hill: Urban Space, Late Modernity and Film Noir in Fritz Lang's and Joseph Losey's M ," in Wide Angle (Baltimore), vol. 19, no. 4, October 1997. Elsaesser, Thomas, "Fritz Lang: The Illusion of Mastery," in Sight and Sound (London), vol. 10, no. 1, January 2000.
. . . In fairy tales the most simple and most moral law of mankind is upheld. The good are rewarded, the evil punished. The good becomes more touching through sorrow, the evil more hateful by the initial success of their wickedness. Film yields the satisfaction of the fulfilled law just as naively as does the fairy tale, only in a form which conforms with its time. Certainly M , Lang's first sound film, functions in this manner. Considered by most critics to be Lang's masterwork, M concerns the fulfilment of moral law while amply reflecting the horrors of its time: the years following World War I in Germany, a period, according to Lang, "of the deepest despair, hysteria, cynicism, unbridled vice." Rampant inflation and other chaotic elements gradually eroded the public order. By 1930, the year before Lang made M , Nazi paramilitary groups, with their own police and tribunals, murdered, bombed, and sabotaged while the Weimar bureaucracy slowly strangled in its own red tape. I can't help myself! I haven't any control over this evil thing that's inside me. It's there all the time, driving me out to wander through the streets. It's me, pursuing myself. I want to escape to escape from myself! But it's impossible. I have to obey. When pursued by this doppelgänger , he whistles a theme from Peer Gynt , an appropriate leitmotif for his personal demon. A capricious and irresponsible character with no sense of self, Gynt saved his own life by allowing another man to drown. Similarly, Beckert keeps his own divided psyche intact by killing young girls, by submitting irresponsibly to his most primal urges. Lang portrays Beckert as both doppelgänger , victim and victimizer, and Gynt, a self-absorbed child, in a series of images, the chief ones being mirrors and other reflective surfaces. While the police attempt to develop a psychological profile of Beckert the camera cuts to Beckert peering and making faces at himself in the mirror. In another scene the camera catches Beckert eating an apple and looking into a store window where we see him surrounded by a diamond-shaped display of knives; when the camera shifts back to Beckert's point of view, we see a mirror at the back of the window display—again surrounded by knives—where a little girl, a potential victim, suddenly appears. Beckert then begins to whistle the theme from Peer Gynt , indicating that his doppelgänger has assumed control. Finally, Beckert doesn't know that his doppelgänger has become visible to others as well until he sees reflected in the window the mark of Cain, the "M," chalked on his shoulder. Beckert's shadow is also a projection of the doppelgänger . As Elsie's ball bounces against a billboard posting a reward for the murderer, his shadow falls across the pillar—a visual echo of the "evil man in black" (with a chopper) portrayed in the opening children's ditty. Such images suggest two ideas: 1) Beckert is self-absorbed and involuted, and 2) Beckert can be known only through his projections. The first point is conveyed through various visual and aural images: the target in a toy window spiralling endlessly into its own centre (recalling the circles on the policemen's map); Beckert's oral fixations (eating apples and candy, drinking brandy, smoking cigarettes, biting his hand after a foiled abduction attempt); Beckert's relative silence until the last scene when he is forced to come to his own defense (that is, he can only speak to himself or to children). His projections and oral obsessions ultimately reveal and trap him: a pack of cigarettes puts the police on his trail, and his compulsive whistling alerts the beggars to his presence. He is trapped by his own "garbage" as it were (another example being the red pencil shavings). Lang repeats this theme by locating Beckert's final hiding place in a small locker full of junk—a vivid metaphor both for the meaningless disorder of his mind and for his self-confinement. Other scenes reinforce this notion: Beckert is stalked by beggars who live off the refuse of others, and he is ultimately brought to trial in an abandoned brewery by society's outcasts. Beckert's personal chaos aggravates the chaos existing on the social plane: the apparent struggle between the police (who symbolize the Weimar Republic) and the underworld (who symbolize the Nazi organization). The real struggle, however, is between the two groups, who represent control, and Beckert, who represents lack of control. The erosion of control in postwar Germany is thus reflected in the growing similarity , not struggle between the two organizations. Lang conveys this resemblance through skillful editing and scripting and by the use of similar settings, camera angles, and images for the two groups. Lang's portrayal of their parallel investigations emphasizes the complementary nature of the police and the underworld. The camera cuts back and forth between police conferences and underworld meetings to show the following: a gesture and remark begun by the head of the underworld are completed by the chief of police. After a safecracker declares that the police must stop looking for Beckert in the underworld, an elderly detective concludes that the murderer must be a "peaceful little family man who wouldn't hurt a fly." 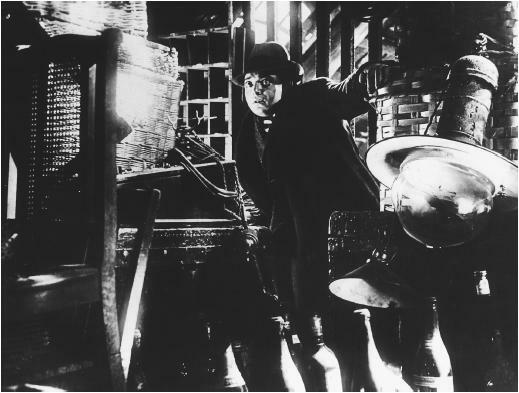 A burglar stands up and leans against the back of his armchair, while the scene shifts to an inspector leaning over the back of his chair. Both rooms are slowly engulfed by cigarette smoke as the meetings progress, and the people get up and wander about as the parallel discussions unfold. Identical camera angles reinforce the similarities in dialogue and settings. The ultimate exchange of identities comes near the end of the manhunt and involves the leaders of the two groups: Schränker, the head of the underworld, disguises himself as a policeman to penetrate Beckert's hiding place, and Lohmann, the chief of police, uses "illegal" methods (lies and blackmail) to determine where the underworld has taken Beckert to be "tried." Not content to make a "talking picture" as such, Lang again uses the technical innovation of sound to complement the message of the camera. Film scholar Thierry Kuntzel has argued that, to connect the police and the underworld, Lang employs two separate chains of visual and aural clues. At first, the underworld's surveillance (visual) and the police interrogations (aural) yield no results. Then two important clues emerge: the letter to the press (visual) and the whistling in front of the blind man (aural). The letter ultimately yields two visual clues for the police—the cigarette pack and the pencil shavings—whereas the underworld narrows in on Beckert through two aural clues—Beckert's second whistling in front of the blind man of the Peer Gynt theme and the sounds he makes while trying to escape from his hiding place. In equating the police with the underworld Lang muddies the distinction between good and evil, order and chaos, on the social plane. In M 's final judgment scene, the distinctions are obscured on the personal plane as well. In his eloquent plea before the kangaroo court, Beckert changes from villain to helpless victim, both of his doppelgänger and of the criminal element of society. How can Lang deliver his fairy tale ending of a fulfilled moral law when innocence and guilt have become so hopelessly confounded? Lang's solution is to move "above" the action aurally, just as in earlier scenes he moved above the action visually—employing overhead or crane shots to imply omniscience or a divine perspective. We hear off-camera, "In the name of the law," and the action freezes. Because we do not see the speaker, higher law is implied—one that will stop the criminal elements of society and protect both innocent children and the murderous child within Beckert. Lulu Madame de . . .